Dorothy Lee Felder was born on December 26, 1934 in Shreveport, Louisiana via the union of Eddie Johnson and Daisy Nelson. Dorothy went from labor into rest on Saturday, January 12, 2018 at the age of 84. She was the oldest of six siblings. Upon graduating from Booker T. Washington High School in Shreveport, Louisiana, Dorothy moved to Houston, Texas where she began a career as a Nurse. She was employed at Ben Taub Hospital in Houston, Texas as a RN for 23 years and retired in February 1984. Her professional and bedside manner allowed her to assist patients with comfort, healing and the best of care. Dorothy was baptized at an early age and later rededicated her life to Christ. She was married once, in Houston, Texas. She was a member of Greater Galilee Baptist church in Houston, TX. Even though she never had children of her own, all of the family loved her and many considered her as their "surrogate mother". She loved to dance, loved people and enjoyed life in every stage. She was affectionately called "Doctor D", "Doctor DJ" or "Dot". On January 12, 2018, Dorothy departed this earthly life and entered into God's rest. She was preceded in death by both of her parents: two brothers: Arthur Nelson of Fort Worth, Texas, Stevenson Johnson of Shreveport, Louisiana. Precious memories will be cherished by her sisters and brother: Eddie Mae Ivory of Shreveport, Louisiana, Betty Banks of Baton Rouge, Louisiana and Roy Nelson (Rita Nelson) of Greenwood, Louisiana and a host of nieces, nephews, cousins, and friends. Dot loved her family very much. We all loved her too and will miss her presence on this earth. She has moved to a better home, but we have this hope to see her again. To send flowers or a remembrance gift to the family of Dorothy L Felder, please visit our Tribute Store. 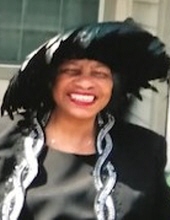 "Email Address" would like to share the life celebration of Dorothy L Felder. Click on the "link" to go to share a favorite memory or leave a condolence message for the family.